Caption slip reads: "Photographer: Glickman. Date: 1957-12-30. Reporter: Klein. Assignment: Husband and wife booked -- robbery. 1 shot: Mildred Kirk holds puppy as Sgt. Frank Lynch questions her. 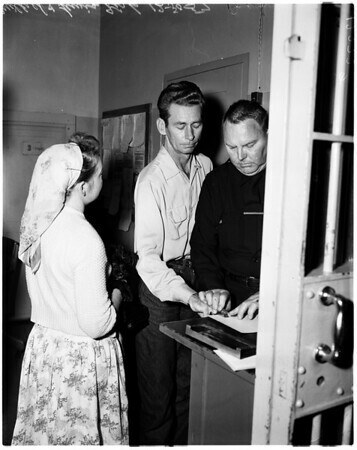 1 shot: Lewis Kirk gets fingerprinted as Mildred watches. 1 shot: Mildred gives Lewis Kirk a farewell kiss before they are parted in Van Nuys jail".